The £9.3 million pro-Brussels propaganda drive by David Cameron’s government ahead of the Brexit referendum gave the ‘Remain’ side an unfair advantage, a cross-party Independent Commission on Referendums has found. In a major report, the Independent Commission on Referendums called for such unfair spending to be banned and demanded curbs on government spending unlimited amounts of taxpayer cash before the last four weeks of campaigning. 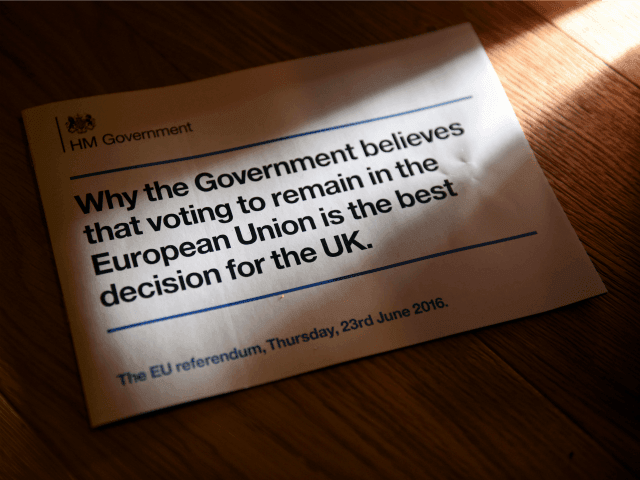 Mr Cameron’s government famously decided to flood British households with pro-Remain leaflets in 2016, with the document claiming the nation would we worse off outside the European Union (EU). The report comes as anti-Brexit campaigners claim the pro-Brexit side had an advantage in the referendum and call for Brexit to be blocked because after Vote Leave was fined £61,000 for improperly registering spending. In the new report, the referendum commission highlights how current rules are 20 years old and have not been updated to keep up with new elements of campaigning such as online advertising. “The rules should enable a level playing field between the competing alternatives,” it states, recommending “current restrictions on government involvement in referendum campaigns should be extended to cover the whole campaign period”. It elaborates: “The Commission is concerned that the current restrictions on government during referendum campaigns permit potentially unlimited spending of public money in favour of one side before the final four weeks. The cross-panel group includes former Attorney General and pro-Brussels MP Dominic Grieve, as well as the official Vote Leave campaign’s co-chair Gisela Stuart, and was set up by University College London’s Constitution Unit. Earlier this week, the Electoral Commission ruled that Vote Leave, the official pro-Brexit campaign, broke electoral law during the referendum campaign by exceeding the legal spending limit of £7 million by around £500,000. The decision followed another fine given to an anti-Brexit group in October, and widespread allegations that the remain side had engaged in dishonest accounting practice.